The biggest threat to juvenile and adult sea turtles in the ocean is their incidental capture during fishing activities. Many hooks, lines, nets, etc. intended for shrimp or fish catch sea turtles instead. Trawling, longline fishing, driftnets, and gillnets cause the most damage. Longlines are especially dangerous for leatherbacks, since most of this fishing is done in the open ocean where leatherbacks are found. They usually aren’t targeting the food on the lines, but due to their large size get caught on hooks as they swim by. Getting Entangled in Nets or Lines: The result is usually death by drowning due to forced submergence, which means the turtle can’t surface for air. Ingestion of or entanglement in gear can inhibit feeding behavior which can also lead to death. Ingestion of Fishing Hooks: This can severely damage the esophagus and digestive system, and removal of these large hooks is very difficult. If snared by a hook or entangled in fishing lines, which is often what happens with long lines, cutting the line does no good; the turtle is likely to either still be entangled or swim away with a dangerous fish hook still lodged in the mouth, neck or flipper. It can be particularly detrimental if the hook is stainless steel. If a stainless steel hook is used, a turtle’s body is unable to dissolve it – even over many years. Accidental Capture and Discardment: When turtles are caught by accident they are often discarded because they are not the target. Turtles are either dumped alive and injured, with no hope of survival, or already deceased, due to drowning or other injury during capture. 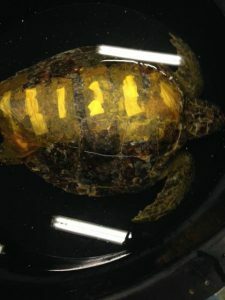 It is becoming more and more common for sea turtles with human-related injuries to make their way to the Karen Beasley Sea Turtle Rescue and Rehabilitation Center. Support local sea turtle conservation groups – consider volunteering or joining a summer nesting program. species. 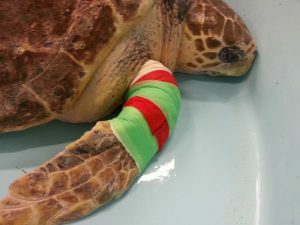 Refer them to sea turtle websites to make a donation. Starting a compost pile in your backyard is a great way to reduce waste. Reduce the amount of chemicals you use – fertilizers, pesticides, motor oils, and paints can be deadly if not disposed correctly. Many of these chemicals get washed into coastal areas and harm marine life. Use biodegradable products or find facilities to dispose these toxic chemicals properly. Don’t purchase turtle products (food, jewelry, leathers.) It’s illegal! Safeguard beach and dune vegetation – it stabilizes sandy beaches, protects from erosion, and provides sheltered nesting sites. EDUCATE OTHERS! Share what you know with your friends and family. Tell them how littered plastics and balloons make their way to the ocean, eventually killing turtles. If you’d like to dive right in, the Karen Beasley Sea Turtle Rescue and Rehabilitation Center offers an amazing program for anyone to adopt a sea turtle and change its life for the better. Explore adoption options and even receive photo of the sea turtle you rescued!